Seatrout are found on the inshore flats and nearshore waters in and around seagrass meadows, mangrove shorelines, deep holes and channels and above oyster bars. On our lagoons the average size is one to three pounds, but the Florida state record was caught on the Indian River Lagoon near Ft. Pierce weighing in at 17 pounds 7 ounces. 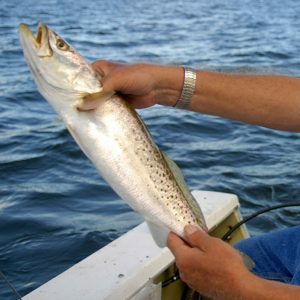 Seatrout spawning occurs inshore in the Lagoons from March through November on both the new and full moon phases. Spotted seatrout are cold sensitive and move into deeper waters during colder months and then back up on the shallow flats during warmer months. They feed on baitfish, mullet, shrimp and crabs depending on the time of year and bait available. Casting with soft-bodied jigs, top-water plugs and spoons can be effective. Trout are very delicate, so returning unwanted or undersized fish promptly to the water is necessary to maintain a healthy population. Spotted seatrout are a good table fare. Free-line live shrimp or small pinfish or pigfish (grunts) near the bottom to entice trout out of grass-bed holes. Attaching a float will allow these baits to drift over the grass beds as you search for trout. During the winter when water level are low and the water is clear, seatrout become an excellent sight fishing target when conditions are favorable. The spring and early summer are the best times to target seatrout with top-water plugs when the silver mullet (finger mullet) return to our region from the winter migration south.